Roughly 200 residents showed up on Monday, Nov. 26, to attend a special session of the Mayor and City Council Meeting, and ordinances discussed included Lambertville’s affordable housing obligations. City Planner Emily Goldman presented the Lambertville High School Redevelopment Plan, (not to be confused with the South Hunterdon Regional School District) which was prepared by Clarke Caton Hintz, and detailed drafts for the construction of new housing units to meet the city’s fair share housing obligations that stem from a 2015 NJ Supreme Court ruling. Lambertville needs to add these new dwellings by 2025, and is intending on meeting most of the requirement with new owner and rental homes on Connaught Hill, the city’s middle hill, which is bounded by Route 179 and Quarry Street. Goldman, the mayor and council took public questions, many of which included potential environmental impacts and the protection of the Holcombe House on N. Main Street. One resident wondered about the construction impact on wells. Goldman remarked that no developer has been chosen yet to for the plan, but the builder would have to do a geotechnical report study “to look into how construction might affect existing wells,” and clarified that all new units will have city water and sewer access. 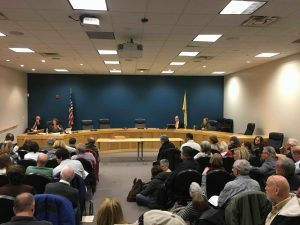 Goldman specified that the redevelopment plan would include 139 total units, with a 20 percent set-aside (67 market-rate townhouses, 44 market-rate apartments, 28 affordable, family rental apartments), not all specific to the high school site however. Twenty-five percent of new housing is required to be rental units (a minimum), and no more than 25 percent can be age restricted. By May 22 of every year, there will be an annual review of the plan’s progress, and a more comprehensive mid-point review has to be completed by July 1, 2020. Major concerns at the meeting had to do with the status of a proposed overlay zone at the Closson Farmstead where the Holcombe House sits. George Washington had stayed at the house in July 1777 and June 1778, and the importance of the site’s historic preservation was mentioned by certain attendees. 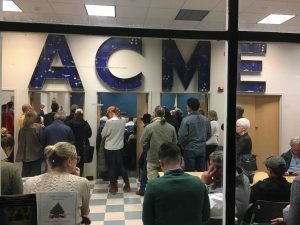 Many locals attended in order to hear updates from the Citizens Against the Penn East Pipeline Committee, and one question addressed how the potential pipeline would affect the hill’s development. Goldman stipulated that since there was no developer as of this time, that concern has not yet come up. Goldman noted that the plan did include Lot 32 (also on page 7 of the report) , which is the only designated lot on the west side of Washington Street, and indicated that the planning board could suggest some pedestrian access there to the hired developer. Goldman began wrapping up her portion of the meeting expressing her preference that undeveloped land on the hill’s steep slopes would be maintained. Why was there no mention of the former OTC/gym site? What will be the % of units for affordable housing?